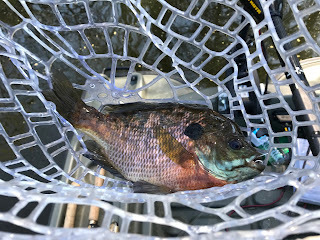 I hope to use this blog as an avenue to express my thoughts and adventures of all of my fishing expeditions and any other journeys I may undertake. I have often said that I've never been bored one minute since I retired. I am so thankful my Dad taught me and my brothers how to fish and hunt at an early age. Most individuals who fish or hunt all started as youngsters. I often wonder why some of my friends, neighbors or other retirees don't fish. The answer could be the parents wasn't interested in fishing so the children never developed an interest. Most children become involved in what the parent's interested is when growing up. That could be hunting, fishing, sports, or any other activity. I know my two grandsons are interested in motorcycles because their Dad's interest in riding motorcycles. They are also interested in fly fishing because their Dad and Pops fly fish, so you see the comparison. I have taught numerous individuals how to fish using casting gear or ultralight gear in my lifetime. Those individuals were all adults. I even taught a few how to fly fish in the short 12 years I've been casting the fly rod. All these individuals had never fished before and are still fishing today. One doesn't have to spend a great deal of money on fishing equipment to catch fish. 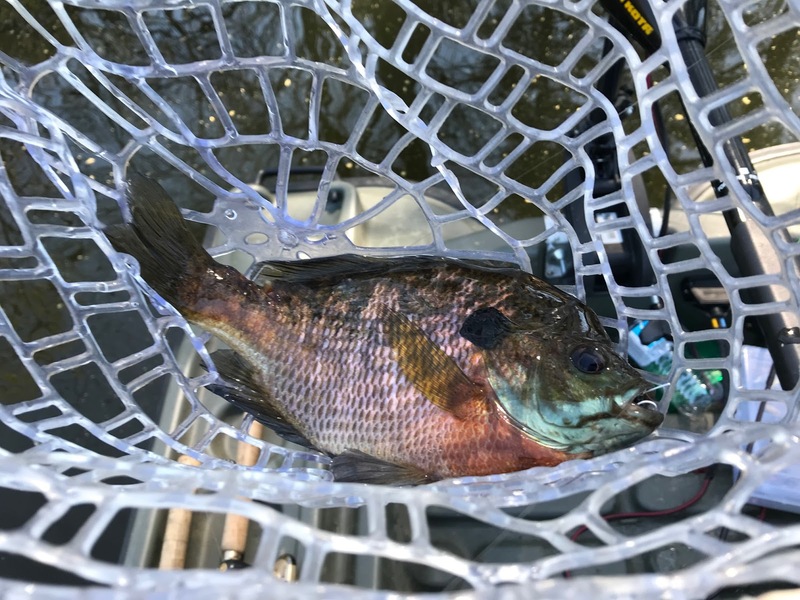 Live bait paired with a spincast or spinning reel will get results on most all water in the U.S. Live bait such as crickets, grasshoppers, and redworms started many of us on our fishing journey. Hopefully that journey will continue for all of us for many years to come. Most of you know that I like woodworking not as much as fishing but a close second. The love of woodworking steered me towards becoming an Industrial Teacher. I spent 35 years in the teaching profession before I retired in 2008. 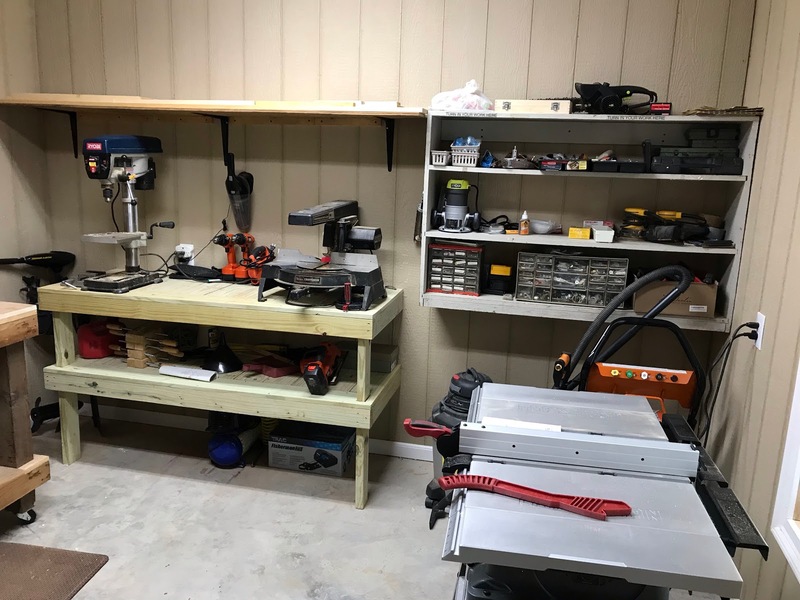 I really enjoyed teaching Industrial Arts because I came in contact with some great students who were interested in building small pieces of furniture to larger pieces such as gun cabinets, tables and desk. I seldom encountered problem students in those 35 years of teaching, because they enjoyed the class as much as I did teaching them. 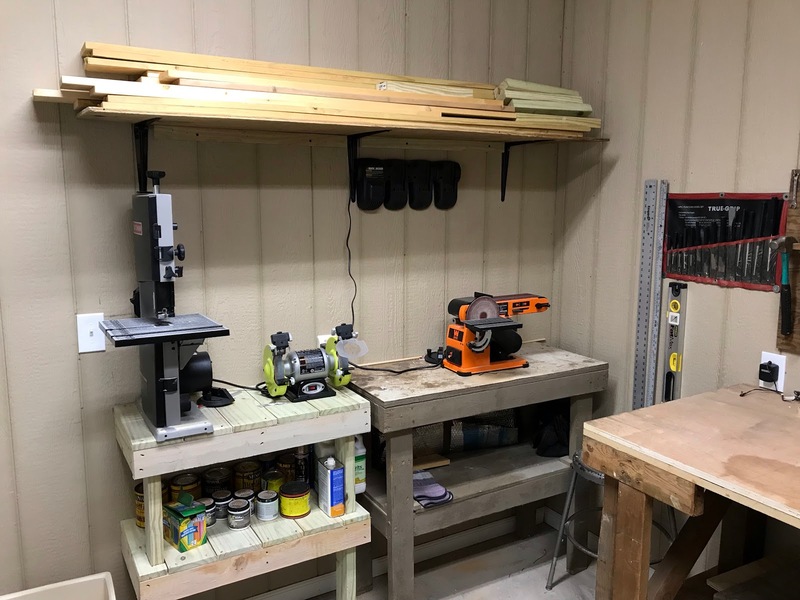 Once we moved back to Jasper I knew the house we were going to build had to have space for a small shop. 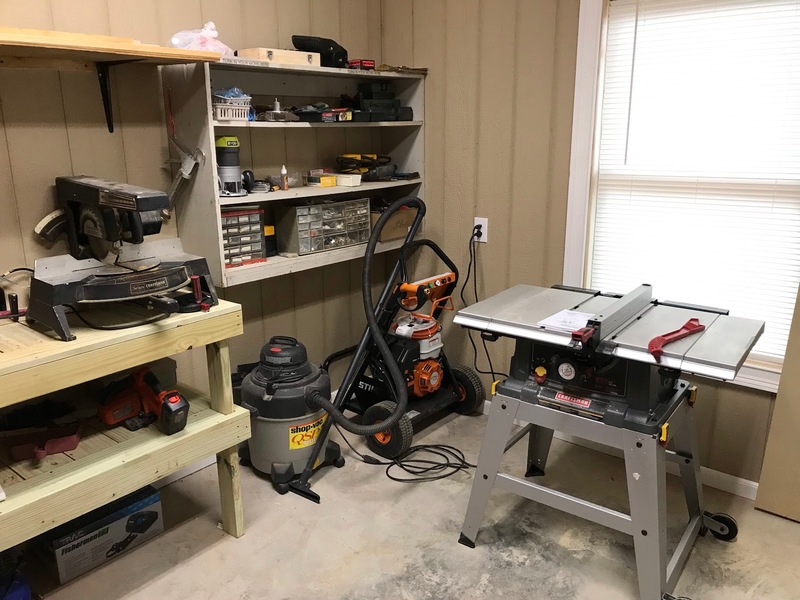 Cathey agreed to give up part of her garage to make the shop happen. I've always liked my hand tools organized and at my finger tips so I can find the hand tool I'm needing to use! 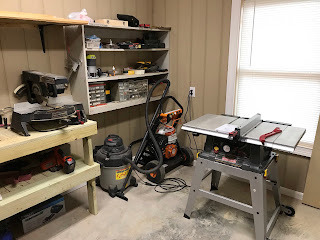 I still have to purchase a woodworking vice to fit in the opening under the table. 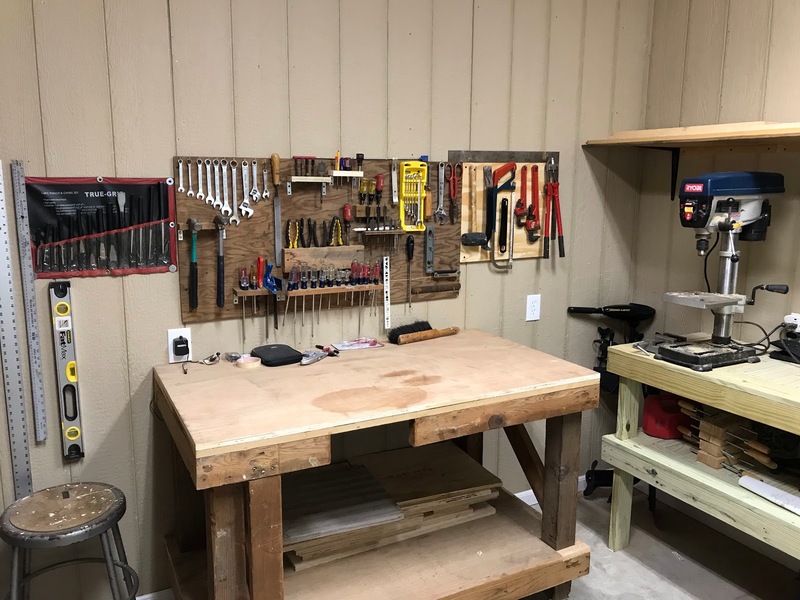 My father-in-law and I built this shop table years ago when he had a shop. The table models machines will work for me with the limited amount of space I have in the 12 X 12 floor space. I've already got projects plan for the grandchildren and some pieces for the house and patio. Keep an eye out for my first project coming soon!! I was lucky to grow up fishing, hunting, and all things outdoors. I believed everyone did and I could never understand the kids in school who didn't know what I was talking about. ---- Nice looking shop you have there. Give me a small block of wood and ten minutes and I could have it looking like mine, which you don't want. Just ask my wife! My Dad was the teacher when it came to fishing. I just wish I'd had time to spend fishing with him as an adult. He passed away when I was only 21. As for the workshop, I only wish my garage looked that neat and clean. You was lucky to have a Dad who taught you the fishing skills you process today. Sorry you didn't have more time with him. Bill I think I was the person that started myself in the world of fishing. As a kid the friends I played with all like fishing. There were many influences over the years. Great shop. My dad started me on the journey in the field. The best gift he ever gave me. I am an avid fly fisherman. I started fishing with my dad when I was five years old and have never known life without fishing. The love of the outdoors has been one of the reasons I have enjoyed fishing for all these years. It is the greatest therapy in the world. When I am on the water I forget about everything else except landing that elusive trout, bluegill, crappie or bass. The Hat Makes the Fisherman or Does the Fisherman Make The Hat?